In the last five years of Narendra Modi-led BJP government, various initiatives have been taken to boost lending activity and support the economy, including Jan Dhan Yojana, MUDRA and Insolvency and Bankruptcy Code (IBC). And instead of being a beneficiary of these initiatives, the banking sector, which is marred by a huge pile-up of non-performing assets, has witnessed weaker growth. The Pradhan Mantri Jan Dhan Yojana aimed at bringing the unbanked section of the society into the banking system was a success with deposit mobilization of Rs 95,382 crore from 35.16 crore people. The Pradhan Mantri Mudra Yojana for medium and small enterprises (MSMEs) was a positive move but is believed to have been plagued by high non-performing loans due to stress in the real estate sector. What was, perhaps, the most significant initiative was the introduction of the Insolvency and Bankruptcy Code to resolve stressed assets of banks, never mind the recent hiccups on the Feb 12 circular. Over Rs 3.5 lakh crore of assets has been referred by the Reserve Bank of India to NCLT under this programme. Another measure to nurse public sector banks to health was the government’s plant to infuse Rs 2.6 lakh crore into the struggling state-run entities. The government has also pushed consolidation in the banking sector, with Dena Bank and Vijaya Bank being amalgamated with Bank of Baroda and LIC bailing out IDBI Bank. Loan growth between the fiscal year 2014-15 and 2018-19 averaged 10.4 percent in the NDA government compared to 17.4 percent in the previous five years of the UPA government. Deposit growth for banks slowed to 9.5 percent during the BJP-led government, compared to 14.2 percent in the second term of the Congress-led UPA government. The gross NPA ratio rose to 11.8 percent in the FY18 from 4.2 percent in FY14. The IBC helped reduce the gross NPA ratio in the third quarter of FY19 to 10.4 percent. 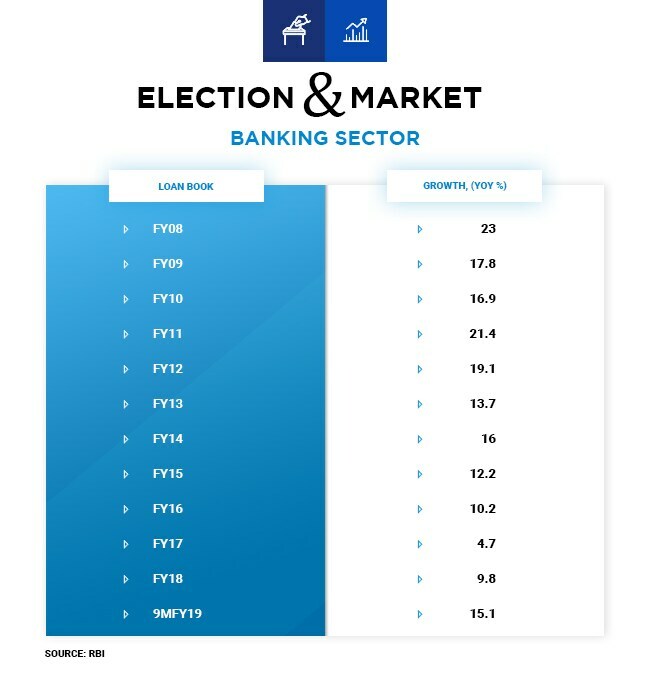 In terms of market performance in the NDA government, banking stocks tracked by the Nity Bank Index on the NSE, clocked a five-year compound annual growth rate (CAGR) of 18.9 percent, outperforming the benchmark Nifty 50 index, which recorded a CAGR of 11.6 percent. During the UPA 2, the five-year CAGR growth rate for the Nifty Bank was 25 percent.